The Weekend Preview is a blog that aims to provide a different angle on the narrative of an upcoming sporting event. The 20-year old Alexander Zverev was upset in the 3rd Round of the Australian Open by the 21-year old Hyeon Chung. As the fourth seed, there was high expectations for the young German, but were they unrealistic? Zverev won 5 tournaments in 2017 to earn him the Number 4 ranking by year’s end. But on closer examination, his best result at the Grand Slams was the 4th Round at the US Open. This is not surprising for a young player, as they would typically have had little exposure to best-of-5-sets tennis over 2 weeks. Throughout their junior career and then on the professional tour they would have played primarily best-of-3-sets tennis over a single week, typically playing 5 matches to win a tournament. Hence, best-of-5-set tennis experience (playing every second day) is gained only over years of exposure at the Grand Slams. Hence, it is no wonder that the super elite of the tennis world consistently find themselves in the second week of Grand Slams as they have developed the mental and physical conditioning to withstand the demands of Grand Slam tournament play. Considering the above, the Round 4 clash between the 21-year old Hyeon Chung and 6-time Australian Open champion Novak Djokovic is an intriguing test case. Chung is a precocious talent (2017 Next Gen ATP Finals Winner) that is renowned for his fitness, yet has never been this deep in a Grand Slam. Djokovic, after struggling physically earlier in his career, has become the epitome of sports professionalism, with his fastidiousness to diet, breathing techniques, match recovery, meditation, etc. But he is also coming off a 6-month break from the tour due to an elbow injury and his lack of match practice was likely an influential factor for his need for on-court treatment to his lower back and leg during his 3rd round match. So do you back the young fit player with no experience this deep in a major? or the battle-weary veteran who knows how to prepare himself and get job the done? 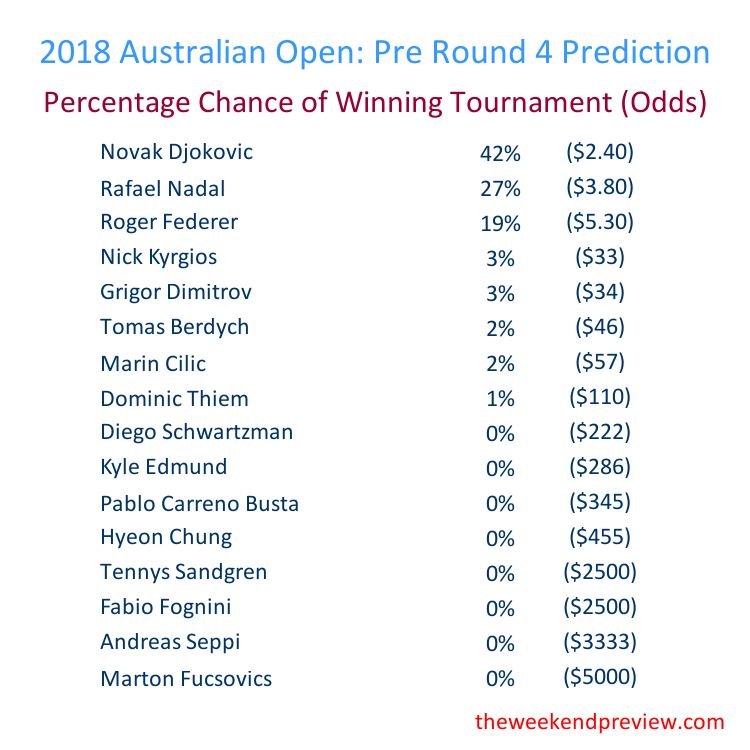 Based on historical performances at the Australian Open, The Weekend Preview’s prediction algorithm penalises players under the age of 23 as they progress through the tournament. Whether, this is due to mental or physical inexperience, it is difficult to judge. But there is historical precedence that Hyeon Chung will likely struggle to progress much further into the tournament and why Novak Djokovic will enter their 4th Round encounter as the strong favourite. This age penalty also has a limiting impact on Nick Kyrgios. If not for his age, Kyrgios would be an even stronger favourite to dispose of Dimitrov and progress deep into the Australian Open. Kyrgios has shown a new level of maturity this year, but he is still unproven past the the Quarter-Finals of a Grand Slam. Rafael Nadal continues to look imperious in this quarter of the draw, with Marin Cilic remaining his most likely challenger. The match of the round is between Grigor Dimitrov and Nick Kyrgios. Although Dimitrov is the number 3 seed, Kyrgios will enter the match as favourite. Dimitrov has been unconvincing in the previous two rounds and will need to lift for this match. The winner of this match would be highly favoured to progress all the way to the Semi-Final. Injury concerns aside, Novak Djokovic would be very happy with how the draw has opened up for him. Hyeon Chung is an exceptional talent, but the 4th Round of a Grand Slam is unknown territory for him. Dominic Thiem is a highly consistent player, but hard court is not his best surface. Tennys Sandgren is playing exceptionally well but he is unlikely to progress much further. Roger Federer has hardly raised a sweat so far, comfortably disposing of his opposition in the comfortable surrounds of Rod Laver Arena in the night sessions. Marton Fucsovics should hold little worry for him in the 4th Round. His biggest challenger is likely to be Tomas Berdych who has quietly progressed to the 4th Round with some very impressive performances. The odds of one of the Big-3 to win the tournament continue to shorten as the challengers slowly drop away. 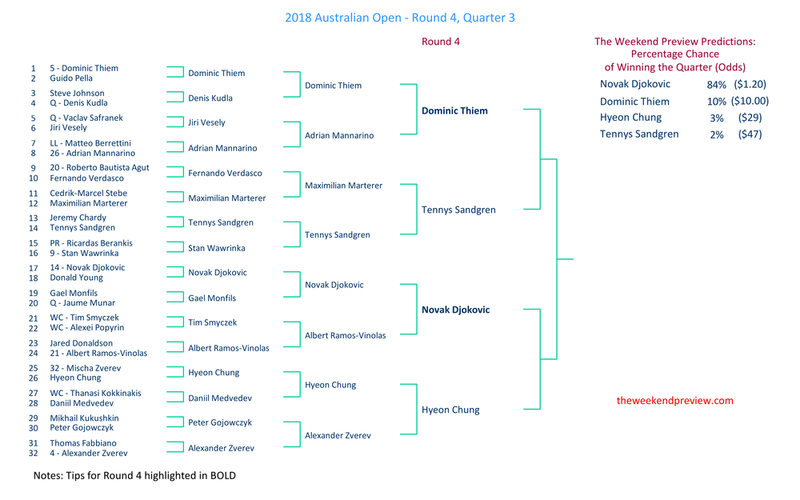 One of Kyrgios or Dimitrov will fall away after Sunday night, with the winner then expected to get to the Semi-Final and likely come up against the tough test of Nadal. Berdych and Cilic represent the best of the rest.